As promised, here are my slides and code from today's presentation. I'll be Presenting on "TDD Demystified" at the Online ColdFusion User Group This Week! If you are interested in TDD but don't quite know how or where to get started join Jon Dowdle (http://jdowdle.com/wp/) and myself at the Online ColdFusion User Group this Thursday 10/21/2010. I'll be covering Unit Testing basics, Test Driven Development basics, and to finish John and I both be doing a live coding demonstration solving a simple TDD Kata problem. I hope to see you there! ColdFusion Developer Fantasy Football League! I just created a Yahoo Fantasy Football league just for you ColdFusion developers out there! Its at http://football.fantasysports.yahoo.com/league/coldfusiongeeks. For bragging rights only, but what great bragging rights they are. The rosters, rules and scoring are all set to the league defaults. The draft will be an auto-pick draft so you don't need to be there to get your team, just set your draft order and forget about it. Please shoot me an e-mail or hit me up on twitter @bittersweetryan if you are interested in participating and I'll send you the password. One of the most confusing things I encountered while learning OO concepts was the concept of interfaces. Definitions of interfaces was were abundant but I couldn't find much information on how they were used in an actual application. This post will focus on a real world example of using an interface in an application and hopefully help clarify how they can be used to create more flexible objects. Also, please feel free to leave me a comment and tell me where I'm way off here, I'm always learning and willing to listen to any good constructive criticism. At a very high level interfaces are types, just like components are types and can be passed around similar to components. The difference between an interface and a component is that an interface has no implementation code (code that actually does something) inside of the function definition. All an interface does is define functions and their signatures. A function's signature is its name plus unique combination of arguments. 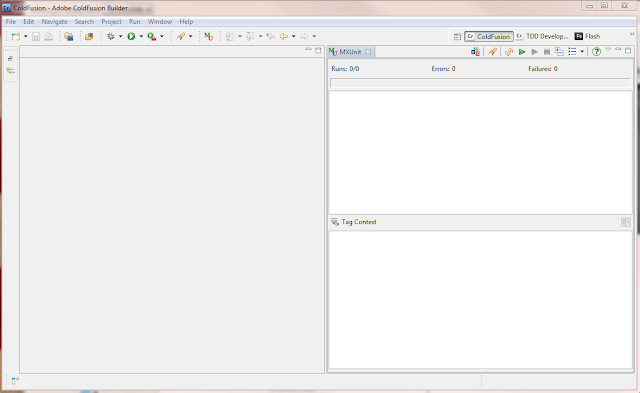 Lets take a look at an example of an interface that defines a "Document" in a system that I am currently working on. interface  hint="I represent either a binary or xml document"
Pretty simple looking, right? The main thing to note here is that there is no implementation code, the function is just a skeleton. This interface is a contract for any component that implements it saying that the component must have a method called GetDocumentData that returns the type of "any". Its up to the implementing component to actually do stuff within the GetDocumentData function. component displayname="BinaryDocument" implements="IDocument" hint="I represent a binary document (word, excel, etc)" output="false"
component displayname="XMLDocument"  implements="IDocument" hint="I represent a XML document (word, excel, etc)" output="false"
component displayname="Attachment" hint="I represent an attachment" output="false"
description="I return a documents data as defined by the Document object." output="false"
For additional reading on Interfaces check out Sun's Java Tutorials here: http://download.oracle.com/javase/tutorial/java/concepts/interface.html. I'd also suggest you read http://www.artima.com/lejava/articles/designprinciples.html where Erich Gamma talks about why programing using interfaces is preferred over inheritance here . First things first, if you are not doing Test Driven Development yet you should at least give it a try. Sparing all the technical aspects of why its good, its just a fun way to code. In order for you to understand why I have my perspective setup this way for TDD a quick explanation of what TDD is in order. The basic principal of Test Driven Development is to write unit tests before you write your implementation code. For instance, if I wanted to write a function in an Account object to test if a username existed I'd start by writing a test called something like "TestIsUsernameUnique" in a CFC Called TestAccount.cfc. Once that test is written it is run and should fail since the IsUsernameUnique method has not been implemented yet. This is an important step in TDD, if that test passes there is certainly something wrong with the test itself. Once you have seen the test fail the implementation code (the actual IsUsernameUnique function) is written and the test is run, and re-run until the test passes. One great way to learn TDD is to watch TDD Kata's. These are screencasts of people doing live test driven development. I've always learned best by example so watching TDD Kata's has been invaluable to my learning of TDD. Now that I've gotten that out of the way lets talk about how I have my development environment setup for Test Driven Development. When I'm doing TDD there are 4 things that are important to me: 1 - my UML diagram, 2 - the Test code, 3 - the implementation code, and 4 - my MXUnit view. Additionally I like to have my outline and console views handy so I can get a quick glance of what functions are in in the code I've written. This is useful when using TDD for a few reasons. First you get more real estate to read the "Tag Context" of the MXUnit view so you can see exactly why your tests are failing. Second, as you'll soon see I need all the horizontal real estate as I can get for my code. Once I have my MXUnit view anchored on the bottom of my screen I'll also do the same process to add the Outline and Console views next to my MXUnit view on the bottom. I add these tabs because I like to be able to see what functions are available in the file I am working on to make sure that the function names in my test code and in my implementation code are the same. I also like to see what MXUnit is doing behind the scenes in the console. Now you can see your test code, test results, and implementation code all on the same screen and are ready to become a TDD ninja. One last step is to save this perspective so it's readily available for your TDD development. Go to Window -> Save Perspective As and enter a name for it. 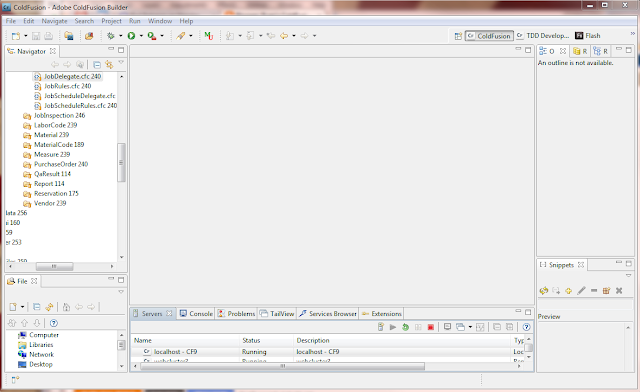 Here are a few quick tips to help increase your productivity using ColdFusion Builder. When creating an object, using a cfinclude statement, or calling a function mouse over the object, template, or function call and hold down Ctrl key to activate a hyperlink for that definition. 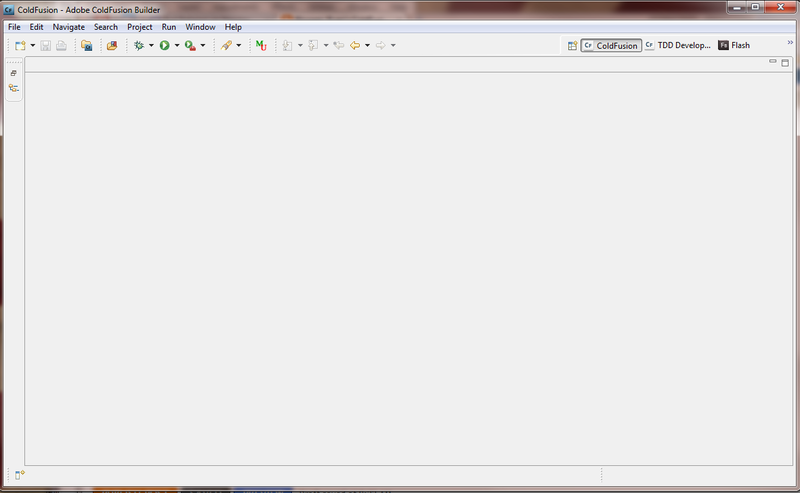 While holding down the ctrl key left click the hyperlink to open the file in a new editor tab. This comes in really handy when tracking down a problem. Assuming that you've added your development server to the Servers View in Builder, always use the Server View to start your ColdFusion server instance. This will bind the console view to your server instance and allow the server to display valuable information in the console. Here is a quick example of the binding in action. Note: This will only work if you do not have the option "Use Windows Service to start/stop the server" selected in your server definition. This gets even more helpful as your errors get more complex because the console view will show you the entire java stack trace. 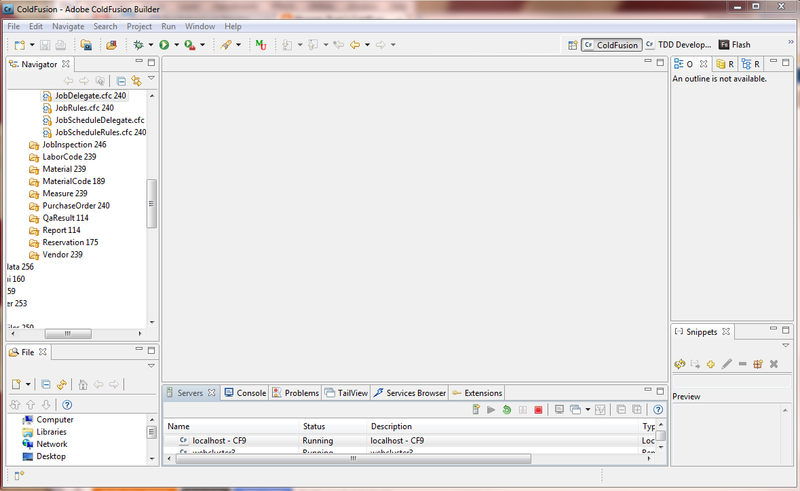 The SQL Editor is a very different animal than the RDS Query Viewer. The SQL Editor can be opened by clicking Ctrl + Alt + S or by right clicking in the code editor and selecting SQL Editor. 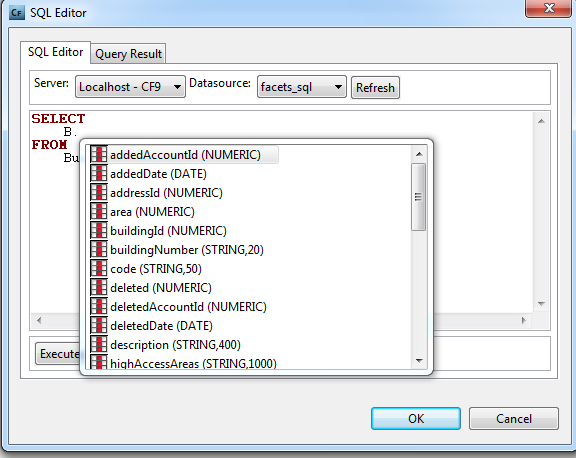 The SQL Editor in CFBuilder will allow you to edit your query, preview your results, and insert the SQL code back into your template. 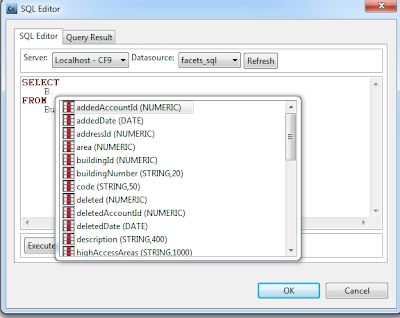 The biggest difference between the SQL Editor and the RDS Query View is that the SQL Editor will provide you with SQL Code insite! This has to be one of the most helpful tools for me in Builder. I love the fact that we can now do line debugging and view variables in real time. Most (but not all) of the time it sure beats the old cfdump cfabort method of debugging. My only gripe about the line debugger is that it tends to run a bit slow. The documentation states that using the "Step Over" command over the "Step Into" command will improve performance, however, this isn't very helpful when debugging a complex OO project. When I first read about the ctrl+click I had no idea how much I'd use it. For those of you who don't know about it, when you create an object or include a file you can hover over the object definition or the file location and hit ctrl-click to open that file or object in the editor. I use these features hand in hand most of the time. As long as your ColdFusion server is started using Builder, the console is very helpful when debugging, is most cases you get the full stack trace of the problem.. I also love the fact that I can open up my administrator and server monitor right in the Builder interface instead of having to switch to my web browser. Even though our ColdFusion staff is small I still have have to frequently consume objects written by other people. Because of method insite I don't need to know the method names or arguments of the public interface of an object before implementing it. 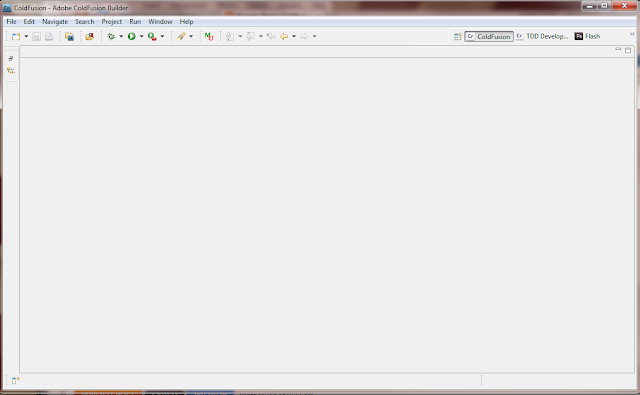 All I need to know where the CFC lives and CFBuilder will tell me what I need to know when referring to that object. While I this is definitely one of my favorite things about ColdFusion builder, it is also one that provides me much frustration. For starters it doesn't work when you pass in an object as an argument to a function. Second it seems somewhat hit or miss for me when inside a cfscript tag. I haven't been able to track down exactly where and why it fails but I think it has something to do with error parser. Last but certainly not least is the support for custom extensions written in ColdFusion! What a brilliant idea, allow the community to enhance your product by extending it with the language we all know and love. I can't wait to see what extensions the community is going to come up with. 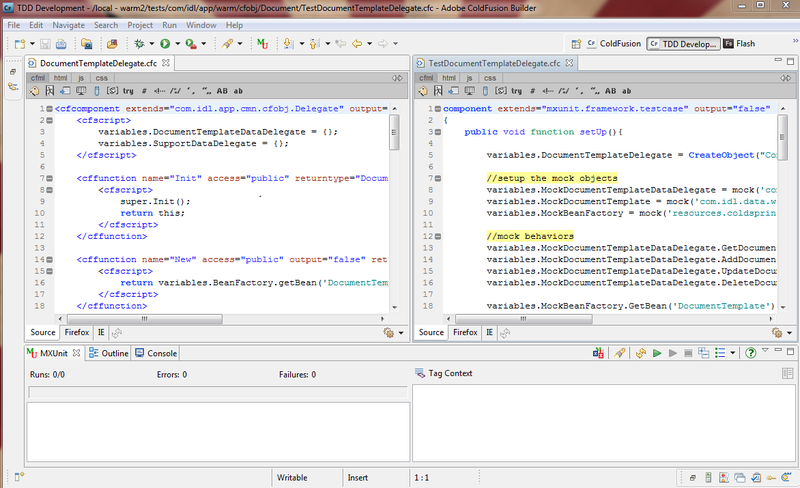 I'll definately be keeping my eye on Ray Camden's ColdFusion Builder contest. 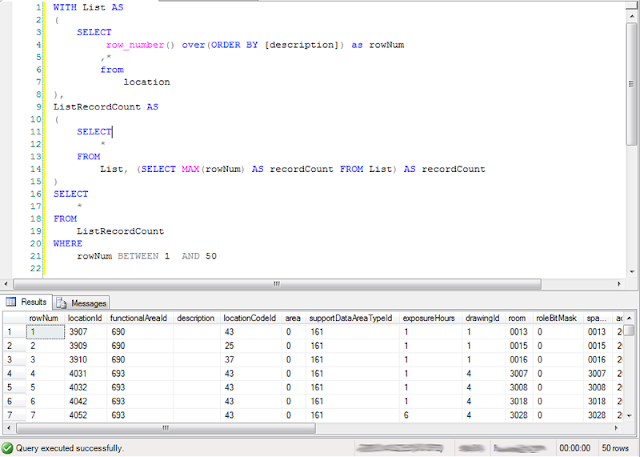 A better alternate to the exec() function in sql server 2005 to run a dynamic SQL statement. 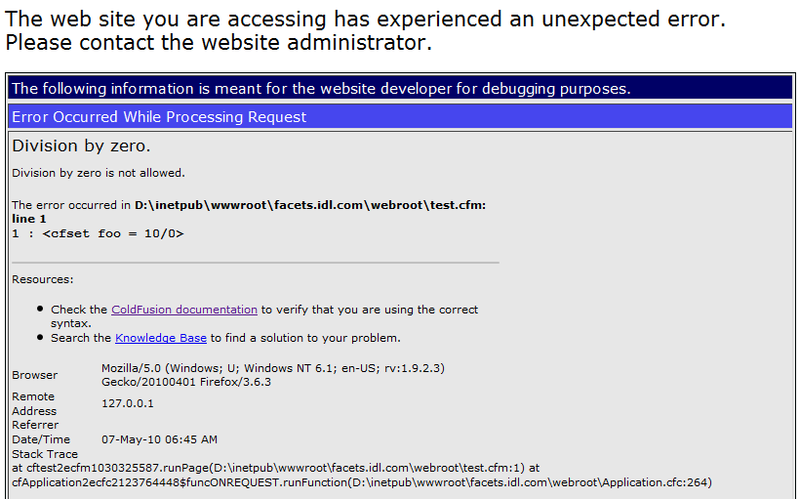 I remember a bug in ColdFusion where a long cfswitch statement would throw an error. This was thought to be fixed, however it still does exist when using switch and case statements inside of a cfscript tag. While working on a large application with lots of data I began to think about optimizing my record paging. I began working on an old school approach of using temporary tables and stored procedures to do my record paging when I decided to hit up google to find a better approach. The simple search of "ColdFusion record paging" didn't bring up anything of use to me but then I searched "SQL Server 2005 record paging" and found something I could use. 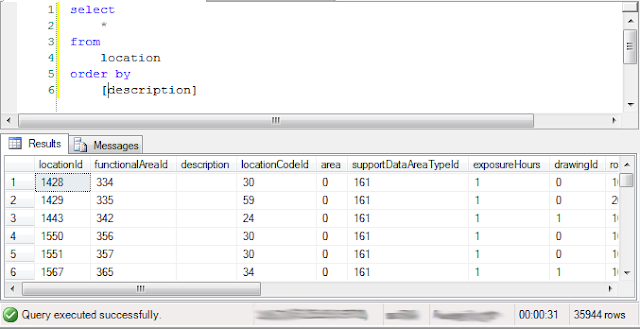 In SQL 2005 a new function called row_number() was added which makes record paging much easier and much more efficient. Now I'm only pulling 25 rows from the database at a time, and I'm getting a record count! All that is left is to use ColdFusion to pass in my start and end rows and to pass in different order by clauses as well. Be careful when using try/catch inside of a cftransaction tag. Now I had incorrectly assumed that if my UpdateLocationCode function would throw an error that the transaction would be rolled back automatically. It turns out that since that error is caught and normal processing continues after the catch tag that this transaction commits just fine. If you don't like the adobe live doc's or using the PDF documentation this site will be your new best friend: http://coldfusiondocs.com/app/. I don't remember exactly where I found this, but I immediately bookmarked and have been using it daily since. Another very nice about this site is that it includes both the Adobe CFML and Railo documentation in separate tabs! 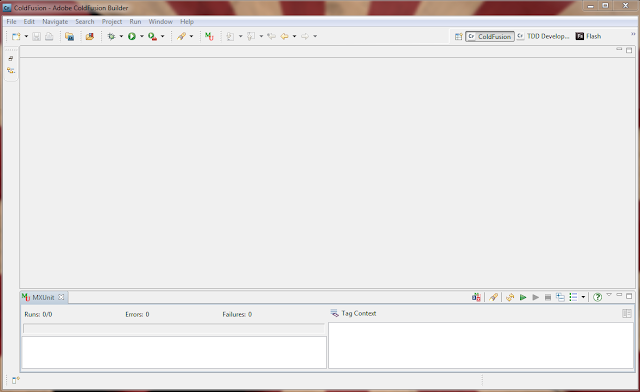 After much head scratching I finally got ColdFusion working on my Windows 7 computer. I've also done this process on windows Vista so I know it works for both Operating Systems. 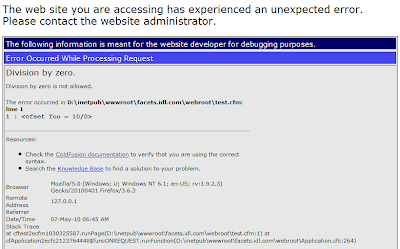 If you install IIS 7 with its default options on 7/Vista and run the ColdFusion 8 or ColdFusion 9 installer you will get a funny little 500 server error when the installer tries to run the post-installation scripts on your server. The solution is very simple, all you have to do is enable CGI and ISAPI in IIS! The following instructions apply to Windows 7 however they are very similar in Vista. 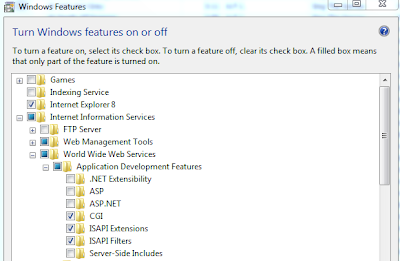 Select "Turn Windows features on or off"
If "Internet Information Services" is not already selected make sure you select it. Check "CGI", "ISAPI Extentions", and "ISAPI Filters"
If you have the ColdFusion post-installation screen still open in your browser "refresh" it. If you don't still have the screen open re-install ColdFusion and this time the post-installation script should run just fine. On my local development environment I run both IIS or Apache depending on weather I'm doing ColdFusion or PHP development. I run both of those servers on port 80 and use manual scripts to start them. I recently installed Skype on my development box and afterwards none of my local servers were starting properly! I ran a netstat - ab and found that Skype was listening on port 80! 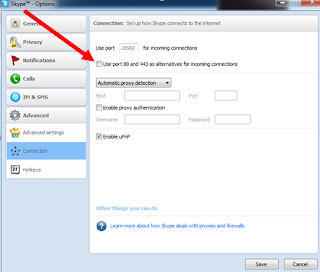 Looking at the Tools -> Options -> Advanced -> Connection setting in Skype I found a little checkbox that says: "Use port 80 and 443 as alternatives for incoming connections." I unchecked this box and my webservers started again! This came in very handy for me today.